– Nylon 60%, Polyester 10%, Latex 30%. – 100% MONEY BACK GUARANTEE-If you aren’t satisfied them please tell us what’s wrong. If we can’t fix your problem, we’ll offer free replacements or give you 100% of your money back, no questions asked. We’re that confident in the quality of our ankle brace. 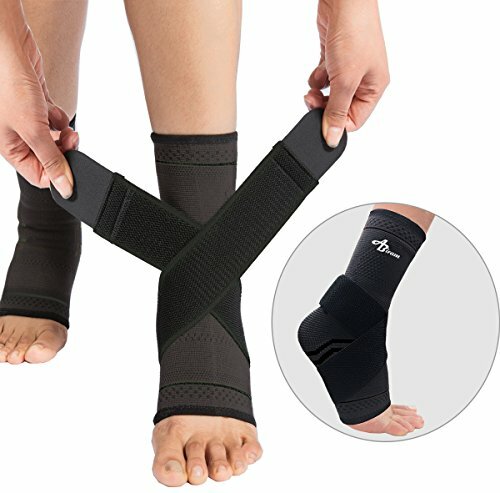 SPEED UP RECOVERY: Improve blood circulation , Eases pain from heel spurs, Achilles heel, Plantar Fasciitis, and other foot discomfort, Preventing swelling caused by long hour standing . EXQUISITE CRAFT: Sewing technology, edge uniform step on the line, excellent workmanship, exquisite fashion dress style. AMAZING UTILITY: Whether you have a long day at work, out for a run, our compression sleeve is extensive enough to be worn anywhere anytime.Won’t making it difficult to put on your favorite slippers or running shoes. 100% MONEY BACK: We’re offering superior service. If you aren’t satisfied them pls tell us what’s wrong. If we can’t fix your problem, we’ll offer free replacements or give you 100% of your money back, no questions asked. We’re that confident in the quality of our ankle sleeves.